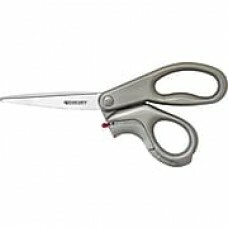 Westcott® 8" 2-in-1 Scissors and box cutter with safety lock switch are perfect for mail rooms, offices and home use. Westcott® 8" 2-in-1 Scissors and box cutter feature sharp, corrosion-resistant stainless steel blade and can be used to open packages with ease. Scissors come with reliable and retractable trigger-action box opener blade for convenience. Scissors and box opener in one!